The county seat of Hennepin County and part of the Twin Cities metropolitan area, Minneapolis is the biggest city in the state of Minnesota. It sits on the Mississippi River, not far from the point at which the Mississippi meets the Minnesota River, and is well-known for being home to many lakes and waterways. Minneapolis covers an area of 58.4 square miles and is located in the central eastern part of the state. The population of Minneapolis is approximately 422,000 people, with over 3.6 million people in the surrounding Twin Cities metropolitan area, which links Minneapolis with the city of Saint Paul. 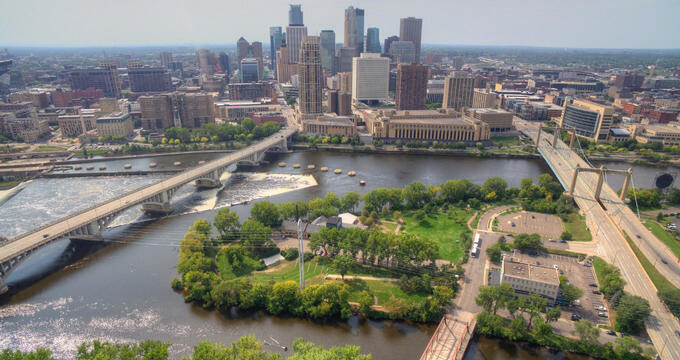 The area that would become Minneapolis was home to Sioux natives for many years until European settlers began to arrive in the late 17th century. Various settlements and forts were established in the area, which became more popular throughout the 19th century, leading to Minneapolis being incorporated as a city in 1867 and standing out as a key transportation hub between other major cities like Chicago and Seattle. The name 'Minneapolis' comes from the Sioux word 'mni', meaning water, and the Greek word 'polis', meaning city. In modern times, Minneapolis is home to many major companies and businesses and serves as a key commercial and transportation hub for the Midwest region of the United States. It's also known for its progressive nature, having one of the biggest LGBT populations in the country, along with its lively nightlife and culture, with lots of live music and performing arts enjoyed alll around the city. Many major musicians including Bob Dylan launched their careers in Minneapolis and the city's music scene is a big part of its culture. Elevation is a geographical term relating to the height of a town, city, mountain, or other location in relation to the mean sea level of Earth. Elevation can influence climate, with higher elevations often resulting in colder mean temperatures, as well as being a key factor in town planning, architecture, and more. The elevation of Minneapolis is 830 feet (264 m), which is relatively low but still higher than most other major cities all around the United States, with most big cities being located at elevations of 500 feet (152 m) or less. The other of the Twin Cities, Saint Paul, has an elevation of 795 feet (214 m), so Minneapolis has the highest elevation of the pair. The mean elevation of the United States is 2,500 feet (760 m), while the mean elevation of Minnesota is 1,200 feet (370 m), making it neither one of the highest nor the lowest states on average, but far below the national average. The highest point in the state of Minnesota is Eagle Mountain, located in Cook County at an elevation of 2,302 feet (701 m). Meanwhile, the state's lowest point of all is Lake Superior, which has a base elevation of 601 feet (183 m). Other major cities in the state of Minnesota apart from the Twin Cities include Rochester, which has an elevation of 1,030 feet (401 m), Duluth, which has an elevation of 702 feet (214 m), Bloomington, which has an elevation of 827 feet (252 m), and Brooklyn Park, which has an elevation of 869 feet (265 m). Therefore, compared to all of these locations, the elevation of Minneapolis is higher than some and lower than others. Minnesota is a relatively flat state, with a small difference between its high and low points, so many cities are at similar elevations. The city of Minneapolis has a humid continental climate like much of the Upper Midwest region. The city enjoys hot temperatures from May through to September, with cold winters where temperatures often drop below freezing point. The daily mean in the hottest month of the year, July, is 74°F (23°C), while the coldest month, January, has daily mean temperatures of 16°F (-9°C). The city has heavy snowfall from November through to March and a lot of rain in the summer. There are lots of things to do in Minneapolis, with the city being well-known for its intricate and beautiful system of parks, which are generally regarded as some of the best inner-city green spaces in all of America. The city's Chain of Lakes also offer a lot of recreational opportunities for fishing, boating, skating in winter, and more. Minneapolis is also home to the Walk Art Center, which is one of the biggest art galleries in the country, as well as several other museums and galleries and a thriving live music scene.